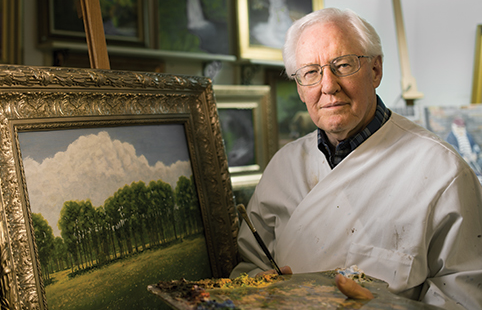 Larry Macfarlane does family history work—by painting others' childhoods. Larry D. Macfarlane (MS ’92), an adjunct communications instructor at BYU, had always thought he would be an art major. By the time he was 5 years old, his parents had recognized his talent for art and supplied him with drawing books and pencils. As a teenager he painted illustrated signs for merchants and spent one summer designing and painting billboards. His senior year in high school he received an art scholarship to BYU. But one term into his freshman year at BYU, after seeing people struggling to make a living as artists, he changed his mind and his major. After serving a mission, he transferred to Utah State University, where a counselor suggested he get a broad education. “The university did not offer an advertising major, so I majored in sociology and minored in marketing,” he says. He received a bachelor’s degree and began his career as a copywriter for an advertising agency. Inspired by the landscapes of artist Kimbal Warren, Larry Macfarlane has returned to artistic ventures initiated in his youth. His career transitioned into corporate communications, where he occasionally found expression for his art in providing layout and design input. As his time filled with raising a family and traveling for work, his passion for art became dormant. His interest in creating art rekindled many years later during an annual pilgrimage to visit the art galleries in Jackson Hole, Wyo., where he was inspired by landscape paintings by E. Kimbal Warren (BFA ’78). “I was taken by the subject matter and his painting technique,” says Macfarlane. When he learned that Warren lived in Mapleton, Utah, only a few miles from where Macfarlane lived in Provo, he contacted the artist and asked for lessons. Warren said he did not teach, but Macfarlane persuaded him to make an exception, and for nine months Warren taught him oil painting. He created a business, Family History in Art (FamilyHistoryinArt.com), where clients bring a photograph they want converted into a painted memory. Macfarlane makes a sketch, and once the client is satisfied, he begins painting. A painting typically takes 30 to 90 days, but if the painting is small and the subject is not too complex, Macfarlane can complete it in two weeks. Popular items include pets, childhood homes and schools, ancestral lands, vacation spots, and vehicles. He finds joy in seeing the reaction of people who receive a preserved memory that can be hung on a wall. Some memories are more challenging to paint than others. “A friend asked me to do a home and show how it looked when his father was raised there,” he says. “The home is different now. It took months to come up with a close representation of how it looked before. I had to talk to relatives, jog their memories, and make several sketches.” Another difficult painting was his son holding a green water snake. “It’s hard to capture your children accurately,” says Macfarlane. He finds the process of painting and helping people preserve memories so satisfying that he plans to keep painting until he can no longer see the easel or hold a steady brush.